the Galileo golden medal of the Telesio-Galilei Academy. space-time of the expanding Universe" in March 22, 2012 Toulouse University, France. The general questions of quantum theory. A.A.Grib, Problem of noninvariant vacuum in quantum field theory. Moscow, Atomizdat, 1978. 128 p.
Quantum effects in intensive external fields. Moscow, Atomizdat, 1980. 296 p.
Vacuum quantum effects in strong fields. Moscow, Energoatomizdat, 1988. 288 p.
St.Petrsburg, Friedmann Lab. Publ., 1994 (in English). A.A.Grib, Early expanding Universe and elementary particles. St.Petrsburg, Friedmann Lab. Publ., 1995. 125 p. (in English). A.A.Grib, J.-P.Luminet, Essais de Cosmologie. Alexandre Friedmann, Georges Lemaitre. Paris, Seuil, 1997. 342 p.
A.A.Grib, W.A.Rodrigues Jr., Nonlocality in quantum physics. New York, Kluwer Academic-Plenum Publishers, 1999. 226 p.
A.A.Grib, Concepts of modern natural sciences. Moscow, BINOM, 2003. 311 p.
A.A.Grib, Foundations of modern cosmology. Moscow, FIZMATLIT, 2008. 108 p.
A.A.Grib, On the problem of the interpretation of quantum physics. [English transl. : Physics - Uspekhi 56, No. 12, 1230-1244 (2013). A.A.Grib, Yu.V.Pavlov, High energy particles with negative and positive energies in the vicinity of black holes, arXiv:1401.0368 [gr-qc]. A.A.Grib, Yu.V.Pavlov, Geodesics with negative energy in the ergosphere of rotating black holes, arXiv:1304.7360 [gr-qc]. A.A.Grib, A.M.Rasulova, Can one see the infinite future of the universe when falling to Kerr and Reissner-Nordstrom black holes? Gravitation and Cosmology, 18, No. 3, 168-174 (2012). Int. J. Mod. Phys. D 20, No 5, 675-684 (2011), arXiv:1008.3657 [gr-qc]. Theoretical and Mathematical Physics, 169, No. 2, 1589-1599 (2011). Russian Physics Journal, Vol. 53, No. 8, 803-808 (2011) [Translated from Izvestiya Vysshikh Uchebnykh Zavedenii, Fizika, No. 8, pp. 32–37, 2010]. A.A.Grib, V.Yu.Dorofeev, Spontaneous symmetry breaking for long-wave gravitons in the early Universe. Gravitation and Cosmology, Vol. 16, No 2, 85-91 (2010), arXiv:1002.2832 [gr-qc] (2010). Gravitation and Cosmology, Vol. 14, No 1, 1-7 (2008). A.Grib, A.Khrennikov, J.Parfionov, and K.Starkov, Quantum equilibrium for macroscopic systems. Journal of Physics A: Mat. and Gen. 39, 8461-8475 (2006); arXiv:guant-ph/0308074. A.A.Grib, G.N.Parfionov, Can a Game be Quantum? Journal of Mathematical Sciences 125, No. 2, 173-184 (2005); arXiv:quant-ph/0502038 (2005). A.A.Grib, Nonzero cosmological constant and the many vacua world. A.A.Grib, Quantum physics, randomness and religious experience. Pages. Theology, Culture, Education. The Journal of St. Andrew's Biblical Theological College 8 : 2, 271-282 (2003). A.A.Grib, Modern physics and religious revelation. In: "Two Cities. The Dialogue of Science and Theology. East and West European Traditions." Moscow: Russian Academy of Sciences, Institute of Phylosophy, 2002, pp. 181-207. Int. J. Mod. Phys. D 11, No 3, 433-436 (2002). arXiv:hep-ph/0006086 (2000). A.A.Grib, Particle creation in the early Friedmann Universe and the origination of space-time. General Relativity and Gravitation 32, No 4, 621-635 (2000). A.A.Grib, The Anthropic Principle in the Cosmology: Its Significance. Pages. Theology, Culture, Education. The Journal of St. Andrew's Biblical Theological College 5 : 3, 430-439 (2000). Gamow in Rio and the discovery of the URCA process. Astronomical and Astrophysical Transactions 19, Iss.3 & 4, 669-673 (2000). Problem of Time in Quantum Theory and General Relativity. RP 51/99, Unicamp. Brazil, 1999. A.A.Grib, R.R.Zapatrin, In search of quantum topology. Hadronic Journal 22, 454-471 (1999). V.A.Bubovich, A.A.Grib, Quantum computations on macroscopical automata. Helvetica Physica Acta 72, 262-273 (1999). A.A.Grib, Comment on the paper: Does the Unruh effect exist? Pis'ma v ZhETP 67, No 1, 86 (1998). [English transl. : JETP Letters 67, No 1, 95 (1998). Gauss, Dostoevsky, Einstein and adventures of non-Euclidean geometry. IMECC RP76/96, Campinas, Brazil, 1996. A.A.Grib, A.A.Terentyev, The Cosmos of the Ancient Jainas. Ariavarta. Inaugural issue. St.Petersburg, 1996, pp.224-233. A.A.Grib, R.R.Zapatrin, Topologimeter and the problem of the physical interpretation of topology lattice. A.A.Grib, Particle creation and the origin of the visible Universe. Gravitation and Cosmology 2, No 3, 189-191 (1996). A.A.Grib, W.A.Rodrigues, On the problem of conformal coupling in field theory in curved spacetime. Gravitation and Cosmology 1, No 4, 273-276 (1995). A.A.Grib, E.A.Poberii, On the difference between conformal and minimal coupling in general relativity. Helv. Physica Acta 68, 380-395 (1995). A.A.Grib, V.Yu.Dorofeev, Creation of particles and entropy in the early Friedmann Universe. Int. J. Mod. Phys. D 3, No 4, 731-738 (1994). Einstein, Friedmann, Lemaitre. Discovery of the Big Bang. Proc. of the Second A.A.Friedmann Intern. Seminar on Gravitation and Cosmology, 1 (1994). A.A.Grib, V.Yu.Dorofeev, Creation of particles in the early Friedmann Universe. Proc. of the Second A.A.Friedmann Intern. Seminar on Gravitation and Cosmology, 117 (1994). A.A.Grib, Quantum logical interpretation of quantum mechanics: The role of time. Int. J. Theor. Phys. 32, No 12, 2389-2400 (1993). A.A.Grib, Time and eternity in modern relativistic cosmology. Studies in science and theology 1, p.93. Geneva, 1993. A.A.Grib, Quantum cosmology, the role of observer, quantum logic. In "Quantum cosmology and the laws of Nature. Scientific Perspectives on Divine Action." Vatican Obs. Publ., p.163 (1993). D.Aerts, T.Durt, A.A.Grib, B. Van Bogaert and R.R.Zapatrin, Quantum structures in macroscopic reality. Int. J. Theor. Phys. 32, No 3, 489-498 (1993). A.A.Grib, Breaking of Bell's inequalitie and measurement problem in quantum theory. Joint Institute of Nuclear Research. Dubna, 1992. A.A.Grib, R.R.Zapatrin, Macroscopic realizations of quantum logics. Int. J. Theor. Phys. 31, No 9, 1669-1687 (1992). A.A.Grib, R.R.Zapatrin, Topology lattice as quantum logic. Int. J. Theor. Phys. 31, No 7, 1093-1101 (1992). A.A.Grib, R.R.Zapatrin, Quantum logical description of two-particle systems. Int. J. Theor. Phys. 30, No 7, 949-959 (1991). A.A.Grib, V.Yu.Dorofeev, Quantum theory of particles with Planckean mass. Proc. of the Fifth Seminar "Quantum Gravity", Moscow, 1990. Eds: M.A.Markov, V.A.Berezin, V.F.Mukhanov, World Scientific, Singapore, 1991, p.202-212. A.A.Grib, R.R.Zapatrin, Automata simulating quantum logics. Int. J. Theor. Phys. 29, No 2, 113-123 (1990). A.A.Grib, Quantum effects in Friedmann space and creation of macroscopic mass. Int. J. Theor. Phys. 28, No 9, 1099-1107 (1989). A.A.Grib, R.R.Zapatrin, Quantum logic: problems and perspectives. Semiotika i Informatika 29, 124-144 (1989). A.A.Grib, Are black holes black? A.A.Grib, V.M.Mostepanenko, Quantum effects in Friedmann space. In: "A.A.Friedmann: Centenary volume". Eds. M.A.Markov, V.A.Berezin, V.F.Mukhanov, World Sci., Singapore, 1989, p.176-190. A.A.Grib, E.A.Poberii, Some observable gravitational effects in the elementary particle physics. In: "Experimental Tests of Gravity". Eds. V.B.Braginsky and V.I.Denisov, Moscow Univ. Press, 1989, p.153-167. A.A.Grib, Yu.V.Kryukov, Violation of T and CPT-symmetry in nonstationary gravitational field. A.A.Grib, E.A.Pobery, Zh.V.Yarevskaya, Gravity field effect on a system of K-mesons. A.A.Grib, A.V.Nesteruk, S.A.Pritomanov, Quantum effects of massless fields in anisotropic spacetime. Class. Quantum Grav. 5, No 8, 1053-1063 (1988). A.A.Grib, A.V.Nesteruk, Quantum effects and exclusion of conformal anomaly in anisotropic space-time. A.A.Grib, V.M.Frolov, Creation of particles with heavy mass. Proc. of IV Seminar "Quantum Gravity", Moscow, 1987. Eds: M.A.Markov, V.A.Berezin, V.P.Frolov. World Scientific, Singapore, 1988, p.875. A.A.Grib, S.G.Mamayev, V.M.Mostepanenko, Particle creation from vacuum by gravitational field: history and perspectives. In: "Problems of Gravitation". Ed. : D.V.Galtsov, Moscow, MGU, 1986, p.55-67. A.A.Grib, Quantum effects in Friedmann space and gravitational constant. In: "Problems of gravitational theory and elementary particles". Ed. : V.N.Melnikov, N 17, Moscow, Energoatomizdat, 1986, p.201-204. A.A.Grib, E.A.Poberii, Gauge approach in gravitational theory and strong interactions. In: "Problems of gravitational theory and elementary particles". Ed. : K.P.Stanyukovich, N 16, Moscow, Energoatomizdat, 1985, p.4-17. A.A.Grib, Bell's inequalities and experimental verification of quantum correlations at macroscopic distances. A.A.Grib, A.V.Nesteruk, S.A.Pritomanov, Conformal anomalies and exclusion of infrared divergences in curved space-time. A.A.Grib, S.G.Mamayev, V.M.Mostepanenko, Self-consistent treatment of vacuum quantum effects in isotropic cosmology. In: " Quantum Gravity", Eds. M.A.Markov, P.C.West. Springer-Verlag, 1984, pp. 197-212. A.A.Grib, N.Sh.Urusova, Vacuum polarization of a massless field and conformal transformations. A.A.Grib, A.V.Nesteruk, Creation of particles and energy-momentum tensor of photons in anisotropic space-time. A.A.Grib, A.V.Nesteruk, Vector mesons in Friedmann space-time. General Relativity and Gravitation 15, No 1, 31-45 (1983). A.A.Grib, A.V.Nesteruk, Creation of vector mesons in Friedmann space-time. A.A.Grib, A.V.Nesteruk, V.A.Shelyuto, Quantum effects of the vector mesons field in Friedmann space-time. In: "Problems of gravitational theory and elementary particles". Ed. : K.P.Stanukovich, N 13, Moscow, Energoatomizdat, 1982, p.29-46. A.A.Grib, Higgs's phenomenon without Higgs's mesons. Izvestiya Vuzov. Fizika 9, 129-130 (1981). A.A.Grib, Von Neumann interpretation of quantum mechanics and the problem of consciousness. In: "Philosophy and development of natural science picture of the world". Ed. 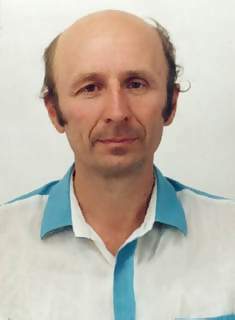 A.M.Mostepanenko. Leningrad, LGU press, 1981, p.75-83. A.A.Grib, Methodological meaning of quantum theory for psychology. In: "Quantum Mechanics and Theory of Relativity". Eds. : P.P.Pavinsky and A.M.Mostepanenko. Leningrad, LGU press, 1980, p.130-145. A.A.Grib, S.G.Mamayev, V.M.Mostepanenko, Vacuum superfluidity near anisotropic singularity: a new phase transition. A.A.Grib, S.G.Mamayev, V.M.Mostepanenko, Vacuum stress-energy tensor and particle creation in isotropic cosmological models. Fortschritte der Physik 28, 173-199 (1980). A.A.Grib, S.G.Mamayev, V.M.Mostepanenko, Particle creation and vacuum polarization in isotropic universe. Journal of Physics A: Math. Gen. 13, No 6, 2057-2065 (1980). A.A.Grib, V.M.Mostepanenko, Spontaneous breaking of gauge and discrete symmetry in curved space-time. In: "Problems of gravitational theory and elementary particles". Ed. : K.P.Stanukovich, N 10, Moscow, Atomizdat, 1979, p.74-91. A.A.Grib, S.G.Mamayev, V.M.Mostepanenko, Pair creation of particles in expanding isotropic Universe. In: "Problems of gravitational theory and elementary particles". Ed. : K.P.Stanukovich, N 9, Moscow, Atomizdat, 1978, p.7-27. A.A.Grib, V.M.Mostepanenko and V.M.Frolov, Breaking of conformal symmetry and quantization in curved spacetime. V.M.Frolov, A.A.Grib, V.M.Mostepanenko, Conformal symmetry breaking and quantization in curved space-time. Physics Letters A 65, No 4, 282-284 (1978). A.A.Grib, V.M.Mostepanenko and V.M.Frolov, Spontaneous breaking of CP symmetry in a nonstationary isotropic metric. A.A.Grib, V.M.Mostepanenko and V.M.Frolov, Spontaneous breaking of gauge symmetry in a nonstationary isotropic metric. A.A.Grib, V.M.Mostepanenko, Spontaneous breaking of gauge symmetry in open homogeneous isotropic Universe. A.A.Grib, V.M.Mostepanenko and V.M.Frolov, Spontaneous symmetry breaking in the interaction of a scalar field with an external vector field. A.A.Grib, V.M.Mostepanenko and V.M.Frolov, Creation and scattering of particles by a nonstationary electromagnetic field in the canonical formalism. A.A.Grib, S.G.Mamayev, V.M.Mostepanenko, Particle creation from vacuum in homogeneous isotropic models of the Universe. General Relativity and Gravitation 7, No 6, 535-547 (1976). A.A.Grib, Vacuum in theory of particle creation in cosmology. In "Classical and quantum theory of gravity". Minsk, 1976, p.113. A.A.Grib, V.M.Mostepanenko, The massive Goldstone bosons in the model of milliweak CP-breaking. Vestnik LGU 4, 14-19 (1975). Leningrad Univ. Press. A.A.Grib, S.G.Mamayev, V.M.Mostepanenko, Particle creation from a vacuum in a nonstationary isotropic Universe. A.A.Grib, B.A.Levitskii and V.M.Mostepanenko, Particle creation from vacuum by a nonstationary gravitational field in the canonical formalism. A.A.Grib, Is movement back in time possible? (In Russian). Priroda 4, 24-32 (1974), Science, Moscow. A.A.Grib, V.M.Mostepanenko and V.M.Frolov, Particle creation from vacuum by a homogeneous electric field in the canonical formalism. A.A.Grib, V.M.Mostepanenko, Broken symmetry in the K-meson theory and Goldstone theorem. A.A.Grib, E.V.Damaskinskii, V.M.Maximov, The problem of symmetry breaking and invariance of the vacuum in quantum field theory. A.A.Grib, S.G.Mamayev, Creation of matter in Friedmann model of the Universe. A.A.Grib, S.G.Mamayev, On field theory in Friedmann space. A.A.Grib, Theory of elementary particles and non-invariant vacuum. A.A.Grib, On possible difference between Heisenberg and Schrodinger representations in quantum field theory. Vestnik LGU 10, 61-65 (1969). Leningrad Univ. Press. A.A.Grib, Nonequivalent representations in quantum field theory and measurement theory. Vestnik LGU 16, 16-23 (1968). Leningrad Univ. Press. A.A.Grib, CP-noninvariance in K-meson decays and nonequivalent representations in quantum field theory. Vestnik LGU 22, 50-56 (1967). Leningrad Univ. Press. A.A.Grib, On the connection of CP-invariance breaking in K-meson decays with nonconservation of strangeness. Vestnik LGU 16, 172-173 (1967). Leningrad Univ. Press. A.A.Grib, Symmetry group of solutions of Klein-Gordon equation in external vector field. Differential Equations 2, No 5, 688-694 (1966). Minsk.